"Test Kitchen" days. In this forum the culinary staff brainstorm with an eye to constantly looking forward- what's getting hot, what's passé, what can we do to be leaders and not followers. From ideas to ingredients, to experimenting to the final recipe. In developing our recipes we draw on the vast experience of a highly trained team of chefs with backgrounds in restaurant fine dining, catering, corporate dining and ethnic cuisines. 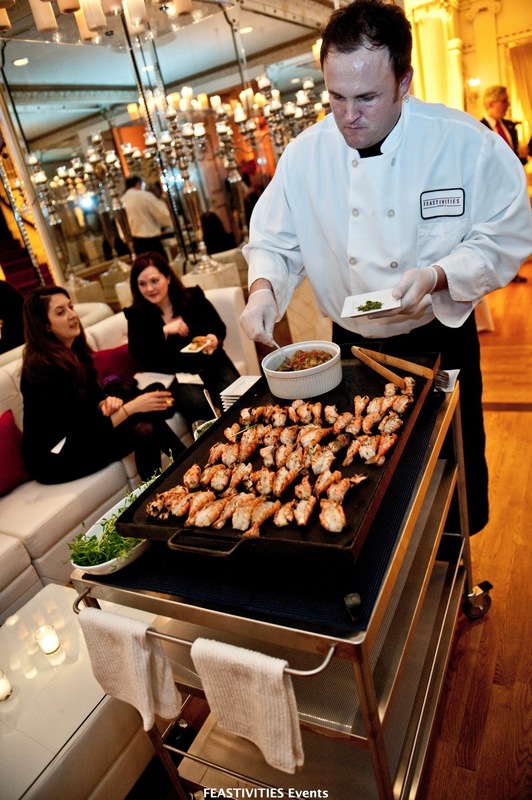 Every item we put on our menu, from braised short ribs to a hot dog, is tasted and critiqued by our culinary, event producers and management team. We are our own toughest critics. The result is a team committed to consistently serving only items that meet the high standards upon which Feastivities Events has been built. Passion, dedication and creativity are the spiritual holy trinity for every true chef and, as with exceptional recipes, each ingredient is essential. The Chefs of Feastivities embody this recipe. Food Quality is more then just buying the best, freshest ingredients, which of course is protocol. It is also about having a professional culinary team trained in how to handle, prepare and present a truly outstanding finished product. Feastivities prides itself in making items from scratch, even crackers!